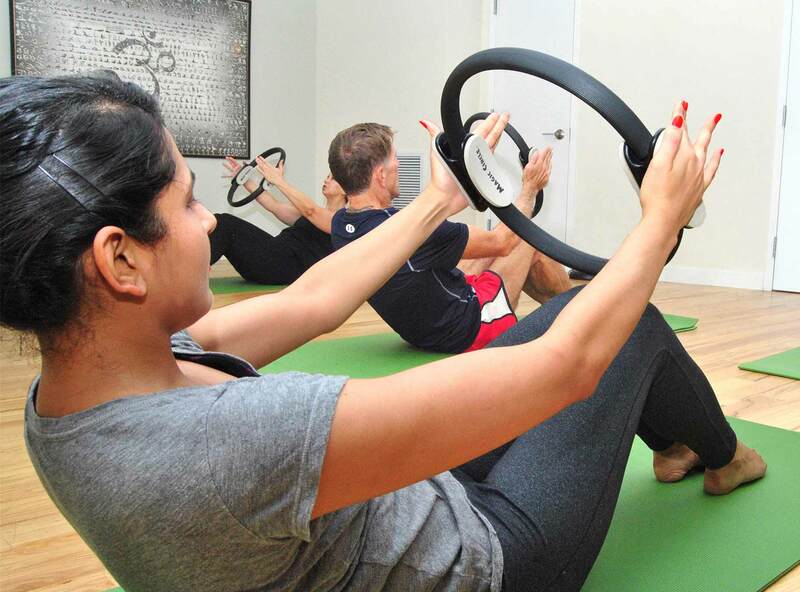 A unique exercise system designed to articulate the spine and strengthen the “core” (abdominal and spinal musculature). Most exercises are done on the floor and some equipment may be used such as balls, bands, rollers and the “Magic Circle”. Some of the basic principles of Pilates are proper breathing, precision of movement, and mental concentration. Level 2 will incorporate more advanced variations of the traditional exercises and challenge those who have been practicing regularly and have mastered the basic technique. Like anything in life, you get out of your Pilates session what you put into it. Approach each session ready to do what it takes to get the most out of your hour and you will leave with that wonderful energized feeling that comes from a great workout. Your mind may tend to wander off, thinking about life and work, plans and memories, but if keep your focus on the exercises you will achieve better results. Please keep in mind that Pilates is a different form of exercise. You will not necessarily feel the same kind of “burn” you are accustomed to experiencing at the gym lifting weights. In fact, our clients report that they feel the third or fifth lesson more than the first. Pilates tends to become more difficult as you progress because you learn how to work harder by engaging muscles at a deeper level and with more focus and better quality of movement. 1. BE PRESENT and CONCENTRATE on following the instructions exactly. Try to use this as an escape from whatever may be on your mind. 2. BREATHE deeply and FOCUS on the breath as per the instructor’s cues. 3. ENERGIZE and CONTROL every motion. Pilates is never about range or speed. 4. Think about the QUALITY and finesse each movement rather than “power” through. Give each exercise 100% of the best you can do. 5. APPRECIATE when an instructor gives a minor adjustment that may seem like “nit picking” to you. These subtle changes can make a significant difference in your workout. 6. VISUALIZE the changes you want to occur in your body and bring that desire to your session. 7. Complete each movement with PRECISION and a feeling of LENGTH. 8. FOCUS more on detail instead of the muscle…the muscle will work better because you have focused on the detail. 9. Do everything with 100% of your ATTENTION and CONCENTRATION. Extraneous conversation can thwart your progress. 10. INCORPORATE what you learn here into your daily routine, whether it’s walking down the street, typing at your computer or working out in the gym.